the anchorage tooth for a bridge. Abutment tooth. From Darby and Walsh, 1995. In dentistry, a natural tooth or implanted tooth substitute, used to support or anchor a fixed or removable prosthesis. 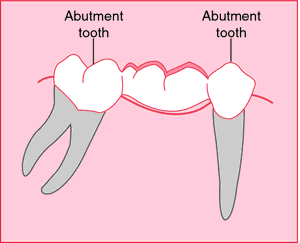 /abut·ment/ (ah-but´ment) a supporting structure to sustain lateral or horizontal pressure, as the anchorage tooth for a fixed or removable partial denture. a tooth, root, or implant that supports and provides retention for a fixed or removable dental prosthesis. A term of art referring to the teeth on either side of a missing tooth or teeth, which are used to anchor a fixed or removable dental prosthesis or bridge. dentistry A natural tooth or implanted tooth substitute, used to support or anchor a fixed or removable prosthesis. n a tooth, root, or implant used for support and retention of a fixed or removable prosthesis. See also pontic. n an abutment whose body is not parallel to the long axis of the implant. 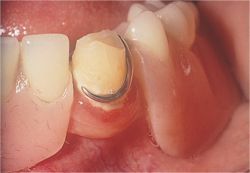 It is utilized when the implant is at a different inclination in relation to the proposed prosthesis. n a custom-made post attached to the superior part of the metal dental implant that protrudes through the gingival tissues and onto which the restoration is fitted; either machined or cast, and used in situations where prefabricated abutments cannot be used. n a cylinder or screw used during the second stage of dental restoration. This serves two purposes: to allow gingival tissues to heal prior to the placement of the permanent abutment, and to maintain proper spacing in the oral cavity before the final restoration (prosthesis) is placed. n an abutment located between the abutments that form the ends of the prosthesis. n abutments splinted together as a unit to support and retain a fixed prosthesis. n a machine-manufactured post attached to the superior part of a dental implant that protrudes through the gingival tissues and onto which a restoration is fitted. n a dental implant abutment that can be prepared and changed from the manufacturer's original design. n a screw that secures an abutment to an implant. It is usually torqued to a final seating position.